Danny, the Champion of the World. A play by David Wood adapted from the book by Roald Dahl and with music by students from Sunnhordland Folkehøgskule ( Norway ). Performed by students from Sunnhordland Folkehøgskule. Nine year old Danny lives happily in a gypsy caravan with his father but his world is turned upside-down when he learns that his father poaches pheasants from the estate of the nasty, greedy Victor Hazell. One night his father doesn't return from a poaching run and Danny fears the worst. Danny sets off on a courageous journey to find his father and with a little help from the village soon finds himself masterminding the most incredible and exciting plot ever attempted against Victor Hazell. In the Musical Theatre Club, pupils from school years 3 to 6 have the opportunity to learn the skills and processes involved in staging a musical performance. Language of instruction is English. 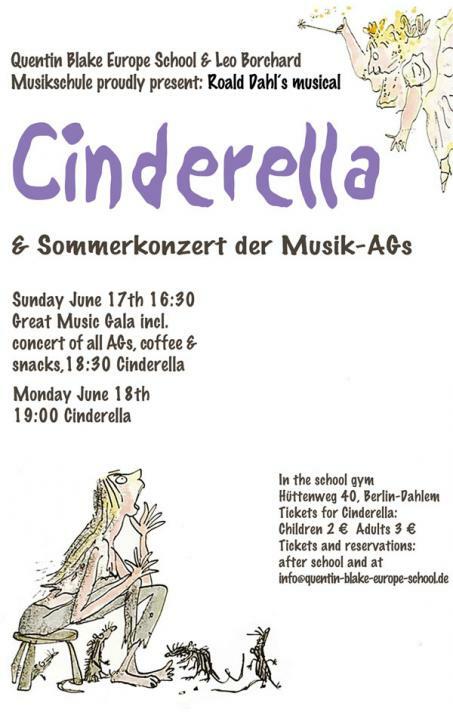 After several months of hard training and rehearsing, the children act, sing and dance in their musical (in English) performed before a large audience at the end of the school year. The club gives the children a great insight into the world of theatre. 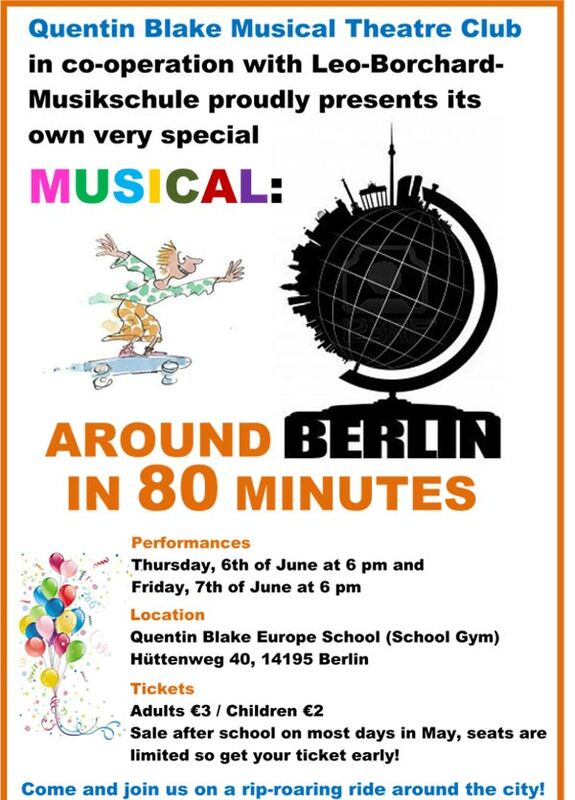 "Wizard of Oz", "How to Eat like a Child", "Peter Pan", "Oliver Twist", Roald Dahl's "Cinderella" and "Around Berlin in 80 Minutes"
The traditional summer musical is a real highlight of the school year and a credit to the school. 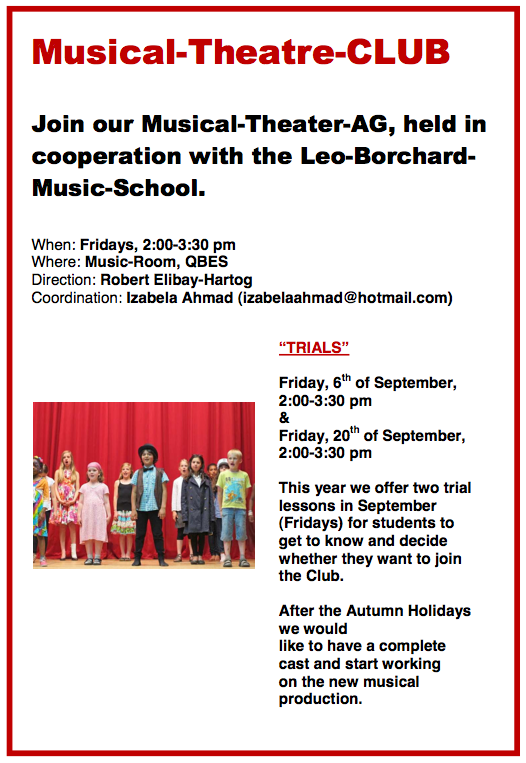 Musical Theatre Club 2013/2014 starts Friday 6th of September 2:00-3:30 pm! 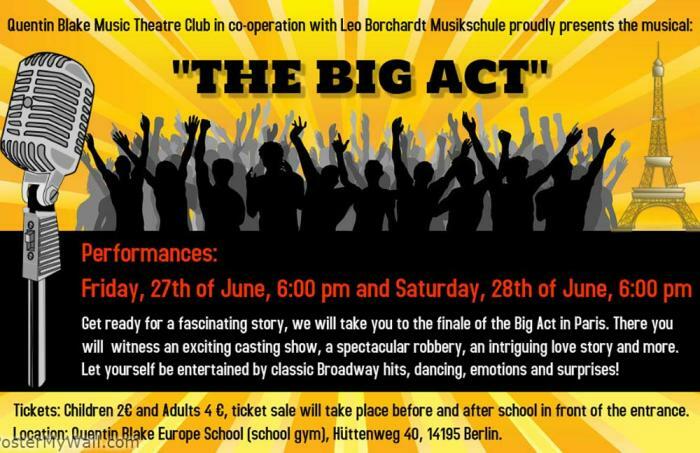 The cost is € 15 a month, payable to the Musikschule.